Lovely, beautiful, well done piece, Roberta! Very, very nice! These are beautiful and I love your choice of colours. very interesting to hear how you went with the wood cut, I had a try a couple of years ago and found it much harder to carve than lino - which I'm most used to. Your print is great, and I love the carved plates too!! 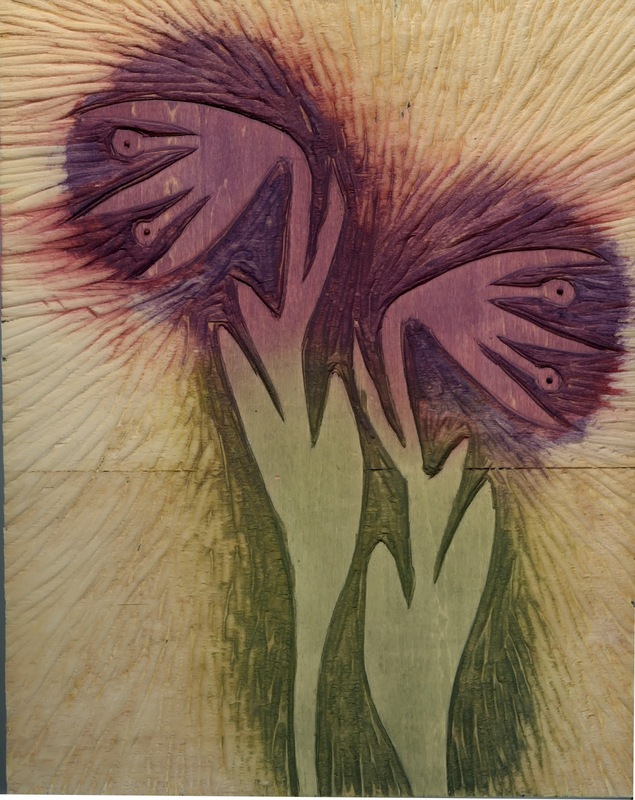 so interesting to hear how you went with your woodcut. I had a go a couple of years ago and found it much harder to carve than lino - which I'm used to. Your print is great and I love the carved blocks too!! Roberta !!! 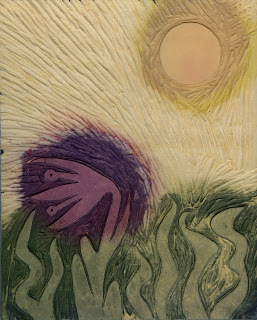 things are looking good here I am wondering if you have combined the gelatin prints with the woodcut here ? Was it Moku Hanga you were doing on the course ? Hope you have a good week carrying on with this ! 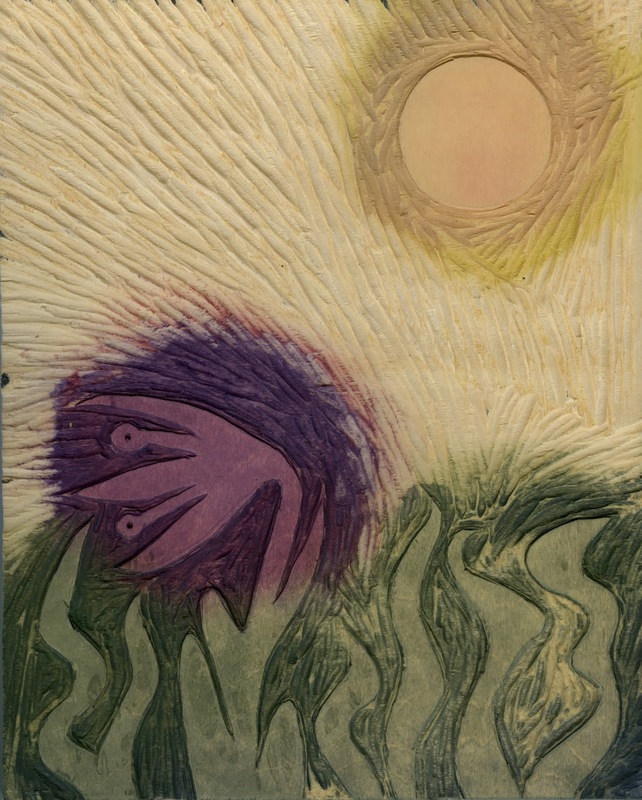 Aline, yes I took some of my gelatin print masks and traced them onto the woodblock. 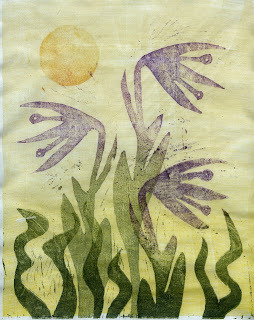 I think it was Moku Hanga. I am still not sure of all the Japanese terms! It is on Shina plywood which is a bit easier to cut. The tools need to be very sharp! Thanks so much Julie. I know what you mean. There are so many wonderful blogs it is hard to keep up! I have the same problem! Those are stunning. It's so cool that you always want to learn more techniques. A true artist. Thanks Candace. I sometimes feel all over the place! I like the texture from your wood cuts. Thank you for mentioning Carla's workshop which I am now trying.